Here’s a name you probably have never heard before: Maria Moreno. 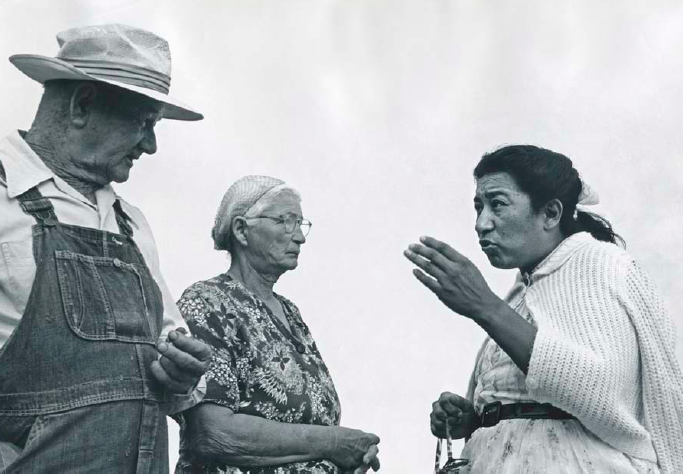 When Laurie Coyle was working as a lead researcher on a documentary about Cesar Chavez and the farmworkers’ struggle 20 years ago, she came across photographs of a woman whose presence transcended the images. The photographs were taken by George Ballis, a leading photographer of the farmworkers’ movement. They showed a migrant mother and farmworker who was clearly on the frontline of union organizing. But few seemed to know who she was. As a filmmaker and documentarian, Coyle decided to hit the road and uncover the story of this enigmatic woman in the photos. The result of her seven years of research is an hour-long bilingual documentary, Adios Amor: The Search for Maria Moreno. 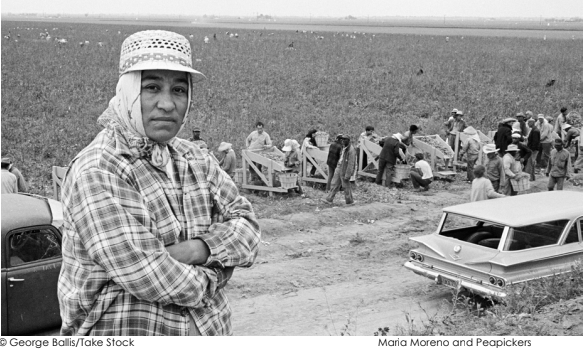 It traces the story of Maria Moreno, the woman in the pictures, and her involvement in the farmworkers movement, through her legacy and her family. This film was produced in the Mission District by Laurie Coyle, a longtime resident. The film will screen twice this weekend at the Roxie Theater as part of the 17th annual SF DocFest. The festival is the biggest and oldest festival devoted to nofiction film in the Bay Area. In Adios Amor, the viewer joins Coyle as she embarks on her search. As she pieces together the clues, she finds Moreno’s family. Though at first they come aboard to help Coyle, the task of uncovering their mother’s history quickly becomes their own personal search to discover her identity. Coyle’s voice in the film becomes a subtle guide that spotlights Moreno’s strength and perseverance in the face of blatant oppression. A kind of mystery shrouds the remarkable photographs, paired with original recordings of Moreno’s captivating voice during speeches and union meetings. Maria Moreno’s voice became her weapon of choice, and she began her fight when one of her 12 children went blind — a condition precipitated by malnutrition. Moreno’s advocacy called attention to the conditions farmworkers faced, which contrasted drastically with the postwar abundance that most took for granted. 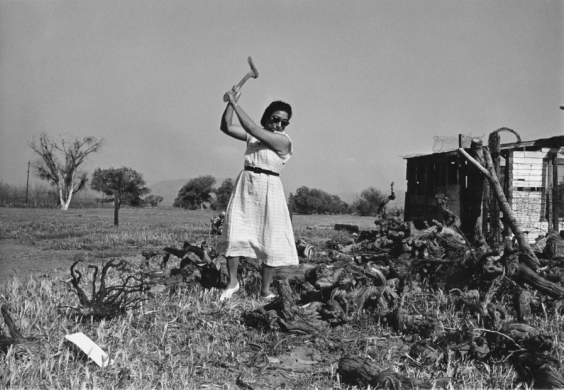 Moreno’s farmworker colleagues elected her as their union representative and she became the first farmworker woman in the US to be hired as a union organizer. As a seasonal worker, she joined the Agricultural Workers Organizing Committee (AWOC) traveling the road nonstop with her husband and children. She played a role in laying the groundwork for the United Farm Workers (UFW) that Cesar Chavez and Dolores Huerta later launched, albeit without Moreno. I will not spoil the film for you, but I will say that her outspokenness got her in trouble. What follows is an unexpected twist in Moreno’s life that may be what makes her short-lived career as an organizer so important. Coyle’s search for Moreno uncovered a tapestry of stories that people were compelled to share with her. These stories prompted the creation of a storytelling initiative called MiHistoria.net. In 2010, in collaboration with the Chicana Latina Foundation, MiHistoria’s first storytelling workshop was held as a way to record and share the Latina experience. Shortly after, Albertina Zarazúa Padilla joined MiHistoria as a storytelling coordinator and workshop facilitator. Her experience as a teacher and oral storyteller made her a perfect match to steer Adios Amor’s sister project and began coordinating all the different layers of this tapestry of bilingual stories. The film and the storytelling initiative foster a platform to gather stories that are often overlooked. Like Maria Moreno’s, these untold stories can be an inspiration. Adios Amor: The Search for Maria Moreno will be screening at the Roxie Theater this Friday, June 8, and Saturday, June 9, as part of SF DocFest. Tickets are available here. For more information, follow the film’s Facebook page.